Berlin is taken from Undefinable Places In-between—a series of short essays I have written, and continue to write, under that title. How can a place have—in the same moment—something and nothing in-between the things that define its edges? Be loaded and empty at the same time? In a city, a volume of air can be enclosed by walls, or a fence, a gate, a painted line, or a neatly ordered adjacent patch that provides delineating contrast to the rubble and weeds next door—essentially appearing to be a patch of nothing—and still, it feels infused with something powerful, unfathomable. 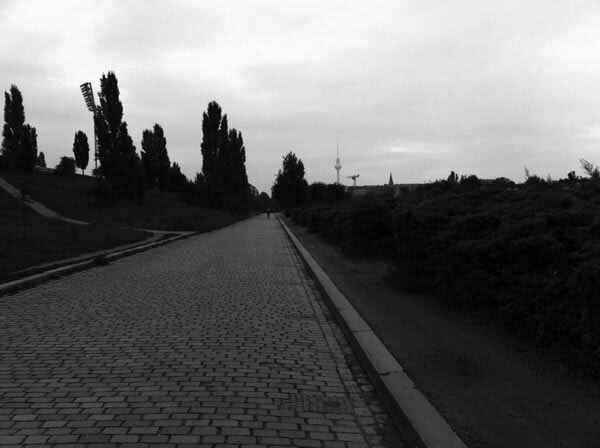 It’s even harder to define exactly what it is that resides within a psychological space; Berlin seems full of them: the liminal places, unspeaking places, and those in-between places and charged zones of emptiness; gaps between ‘there’ and ‘not there’. It’s hard to define what it is, but I would like to know, because then I would better understand Berlin, and probably learn something about all cities.